If you are new to Mayan archeology then it is recommended to use a guide when visiting sites for the first time. Guides are provided at most sites in Spanish and English. German guides can be found through German agencies. Guides must take a course and be certified to work as a professional guide at an INAH site. This is taken seriously and only under certain conditions will you get an uncertified guide. Hotels, resorts and fly-by-night operations generally provide uncertified guides. Sometimes, however, an uncertified guide is extremely knowledgeable. Many guides have grown up in the area and know much about the plant and animal life. Many guides have been hunters and know the landscape well. Some guides actually live in the jungle while others live in nearby towns or cities. A guide who has grown up in the jungle, who still lives in the jungle can show you many interesting things and divulge many unique insights. Each guide has their specialty, some know about what can be eaten in the jungle, some know about the rocks and minerals or animals, some are experts in ruins while others garnish a keen understanding of the area’s history. Visiting a large site for the first time can be daunting and you can even get lost or miss out on seeing some key things. Guides point out hidden objects and devulge interesting facts about things you would otherwise never find out about unless someone pointed it out to you. Small sites do not generally provide guides. You may not want a guide here because they may slow you down. It all depends on the site you are going too and how busy they are that particular day. 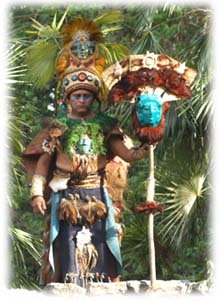 At some sites, like Coba, there are guides waiting at the front entrance. At other sites like Mayapan you have to book a guide through a tour-operator who will travel with you to the site. If you stay near the ruin site you can find an uncertified guide to take you, however, that person might not know much about the ruins but more about other things of interest. 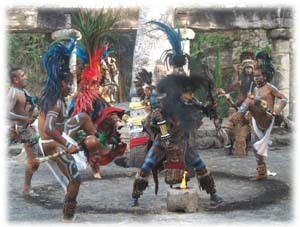 There are a number of Tour Operators that specialize in guiding you around the Yucatan. These vary from outfits that merely have a booth in hotel lobbies who take you to Coba or Chichen Itza with a lunch included to companies offering long distance bus tours that take you out 10 days or more. The long distance tours have everything arranged for you including accommodations at various locations along your route. The accommodations can vary from a tent to a hotel room. Some buses even carry air generators to pump up air mattresses. Of course prices and destinations vary. You do not have to plan or execute the logistics. If you get a good guide(s) you can learn a lot. Can be a lot of fun once everyone gets to know each other. Great way to see a lot of stuff in one trip. You are stuck with whatever accommodations they choose. You must adhere to their schedule. You may get stuck with people you do not like. It is more expensive then doing it on your own. Your guide may not be good and you are stuck with them.